Linkage, ability, and interest matter in major gifts fundraising: how prospects are linked to the institution through personal relationships, the depth of their financial ability to give, and how their philanthropic priorities align with the organization. 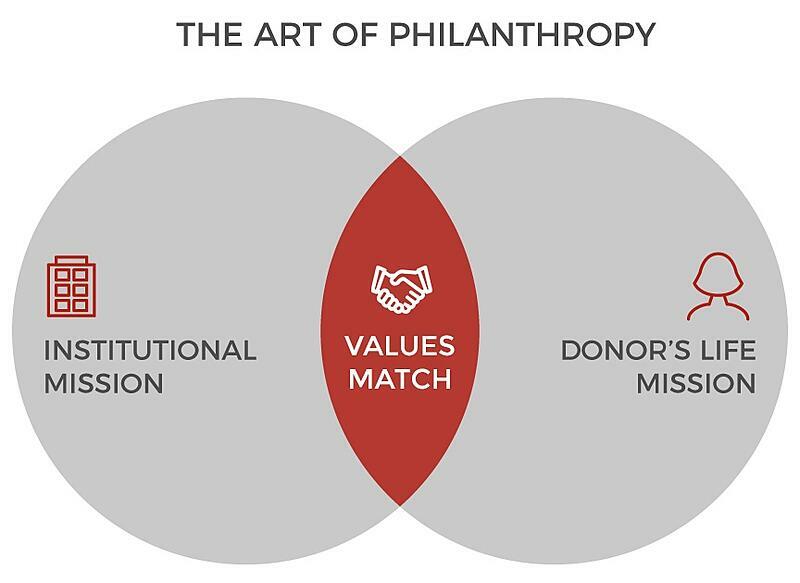 MGOs are tasked with finding the sweet spot where a donor’s life mission overlaps with the institutional mission. By focusing on identification and qualification, development shops can ensure their MGOs build ties with donors who have enough capacity and personal connections as well as overlapping values with the organization. To tackle this challenge, our Strategic Information Services (SIS) team partnered with Target Analytics to create a predictive model of the typical Wolf Trap donor based on giving patterns, demographics, and biographical information. As Blackbaud defines it, “predictive modeling analyzes historical and comparative data about donors to predict a future behavior.” The resulting data helps nonprofits effectively segment donors and build their pipelines. Target Analytics next evaluated Wolf Trap’s database against the model and returned a list of more than 100,000 potential major giving prospects. 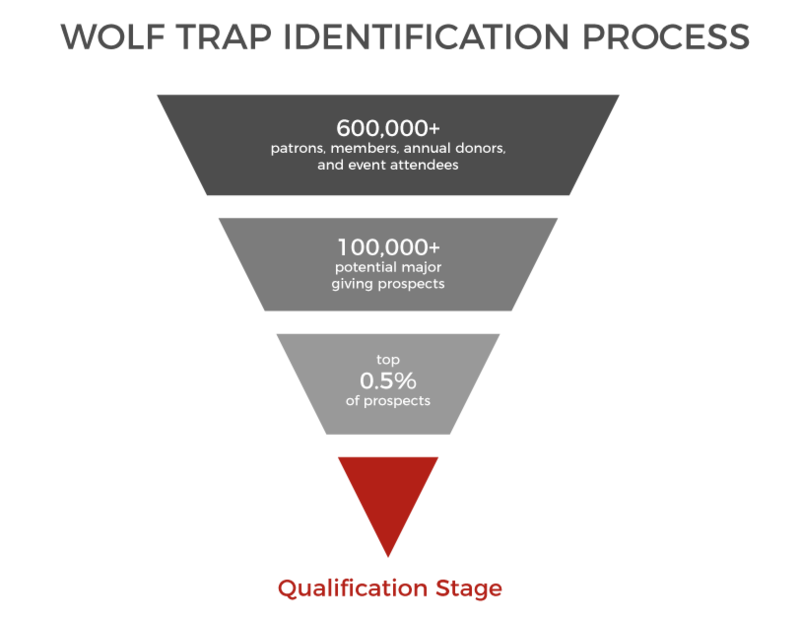 From there, our SIS team dove into the list, cross-referencing the giving history and financial capacity of each individual to pinpoint the top 0.5 percent of prospects Wolf Trap should move to the qualification stage. Leveraging publicly available wealth information with giving history to Wolf Trap was an essential first step towards developing a major gift prospect list. However, experience tells us that only a fraction of donors with the capacity to give a major gift will be qualified, meaning they are interested in an increased level of commitment and involvement with the organization. Qualification involves a personal conversation with the prospect—ideally in person—to determine their inclination, and the process requires discipline and persistence. In the end, it’s a numbers game: if frontline fundraisers talk to enough identified individuals, they will be able to build a robust pipeline of qualified major gift prospects. When faced with a list of thousands of identified prospects and limited staff capacity, meeting each person face-to-face might not be feasible. In this case, we recommend implementing a qualification call program. Alternatively, programs can use an electronic survey, gathering information about prospects’ familiarity with the organization and their philanthropic priorities and ending with an invitation for a follow-up discussion. Both methods of prescreening prospects allow frontline fundraisers to work through a larger number of identified prospects. These touchpoints can indicate which individuals should be visited, which to keep in the annual fund pool, and which to disqualify and remove from all lists. The qualification call program can be adapted for very small development shops that may only have a few hours a week to devote to qualification or may be enlisting the help of volunteers to make the calls. Likewise, the program works well for large development teams (e.g. in universities or hospitals) where a high throughput is needed to cycle through a large and growing prospect pool. Regardless of size and who is making the calls, it’s critical to develop a systematic approach, instituting an outreach protocol that uses mail and email in addition to phone calls. At the outset of the qualification call program, it’s helpful to send identified prospects a letter from the organizational leader. This note should thank them for their prior support and let them know a staff member will be reaching out via phone. For the phone calls themselves, we recommend creating a script, being persistent if the donor can’t be reached initially, and always capturing conversation details in the database. The qualification process is often based on nuance—if a donor appears receptive to further interaction and updates, then they should be considered qualified. Making these calls will involve some rejection, and there will likely be more disqualified than qualified donors. However, it’s important for frontline fundraisers to get past this and qualify donors on a continual basis to keep MGO portfolios filled with active prospects. For Wolf Trap Foundation, qualifying donors has yielded gains in the form of repeat—and increasingly larger—gifts. For example, through intentional qualification, a high-capacity donor (who routinely contributed smaller gifts) made the move to their first major gift within the span of two years. After qualifying another donor with a history of giving relatively small amounts multiple times a year, Wolf Trap was able to engage the donor on a deeper level. “Qualification enabled us to uncover this donor’s passion for early childhood education,” explains Jaffe. “Through subsequent cultivation, the donor learned that our programs matched their philanthropic interests perfectly.” Ultimately, the donor reciprocated with a leadership gift to support Wolf Trap’s Institute for Early Learning Through the Arts. At the end of the day, identification and qualification are the first steps towards building meaningful relationships with donors who have the linkage, ability, and interest to make a major gift. By doing solid legwork at the outset of the fundraising cycle, MGOs and their development programs can build their pipeline and cultivate connections with passionate prospects who can make a significant impact. Christina “Tina” Yoon, Vice President, is a dedicated nonprofit professional who uses her broad experience when advising other nonprofits but brings a fresh perspective to each client engagement. She listens carefully to her clients’ needs and develops customized solutions.